That fact might sound like the punchline to an Indiana Jones joke, until you hear about the most dreaded serpent here in the jungles of Belize. The fer-de-lance is likely the deadliest snake in Latin America, packing an amputate-if-you're-lucky bite if it goes untreated. Its long fangs can go right through a boot, and it's aggressive - unlike many snakes that seem more afraid of us than we are of them, the fer-de-lance won't hesitate to strike. Luckily, killing snakes is what one of our local experts Mandito knows how to do. Not with the machete, although he certainly knows how to swing his. No, this summer, when Mandito saw a snake, he cut down a nearby sapling, crafted a spear from it with one or two quick hacks of his blade, and then stabbed the serpent to death. So why am I here with archaeologists daring the snakes of Belize? 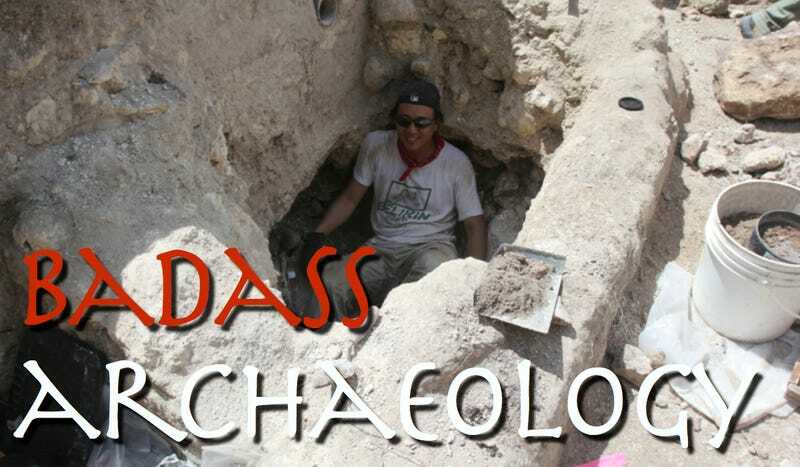 Why did I help excavate human remains this year from ruins, and hang from vines, roots and branches off the side of a giant stone pyramid last year? We're hunting clues to a longstanding mystery - the collapse of the ancient Maya empire. The ancient Maya civilization encompassed an area twice the size of Germany, occupying what is now southern Mexico and northern Central America, including Belize, Guatemala, El Salvador and Honduras. At the height of the Maya empire, known as the Classic period, which stretched from roughly 250 AD to at least 900 AD, perhaps as many as 25 million people lived there, achieving a population density greater than that of medieval Europe. For uncertain reasons, the ancient Maya civilization apparently collapsed more than a thousand years ago, with its population declining catastrophically to a fraction of its former size. Researchers want to find out why. The area where we excavate is known as Blue Creek in western Belize near the southern border of Mexico, which archaeologists at the Maya Research Program have investigated for more than two decades now. Researchers and volunteers such as myself dwell at base camp at Blue Creek in the summer on a hill surrounded by cattle pastures tended by cowboys. Roughly 25,000 Maya once dwelled in Blue Creek home, making it a relatively small population center. However, it seems to have been unusually important for its size - for instance, the fifth-largest known cache of jade in Central America was found here, and even the poor were found buried with the precious stone. Excavations involve us climbing onto pickup trucks every morning for drives that can swerve back and forth and buck up and down over very bumpy and often muddy roads, sometimes in pouring, stinging rain. Troops of howler monkeys wail in the canopies, sounding much like how you might imagine dinosaur roars would've seemed. The work can be hard, no doubt. We have to lug buckets of equipment and jugs of water up and down slippery trails each day. Pick and shovel work to excavate dirt and rock in the hot sun can be backbreaking - there are days when I figure we've each literally moved a ton of earth. All this is no easier in the rain, which just soaks the dirt and makes it heavier to haul. Mosquito bites and monkeys throwing excrement at us don't help either. But it all seems worth it to us when we spot a pair of jaguars on the trail in the morning. When we discover jade ear spools, or obsidian blades, or ornaments made of shell. When we clear all the dirt and foliage off pyramids and tombs to reveal what they once looked like. When we get to delicately work on human burials, we can exhume remains that directly tell us what the people here were like. We can speculate about the lifestyles they might have lived, with their teeth inlaid with jade, or filed to points like vampire fangs. For all the questions we're out here to answer, we intriguingly tend to unearth just as many enigmas. For instance, at Tulix Muul ("Dragonfly Hill," named after the dragonflies seen there when the site was discovered), over a cluster of human burials, a mystery was found in a nook in a wall - a leg bone was plastered into place like a pillar within the cubbyhole, and then a perfectly round pot rim was fitted into place into the entry of the cavity. Nothing like this has apparently been seen in the ancient Maya world before, and its meaning and significance remain entirely unclear. Other puzzles get slowly answered over time. For instance, on a hill directly facing our base camp, a perfectly round structure was discovered - unusual, since the ancient Maya of Blue Creek didn't build round stone buildings. It turns out it may have been a shrine of a style imported from the neighboring Yucatec in the Terminal Classic, the waning days of the Classic period. A structure like this foreign-styled shrine to helps reveal that the collapse of the ancient Maya civilization did not impact everyone there equally. This area might have held out by forming ties with neighboring cultures. There is a lack of precision when it comes to dating certain artifacts of the Late and Terminal Classic period here, such as ceramics, which can make it hard to judge how the site collapsed. However, researchers at the Maya Research Program are now seeking to improve this precision by applying cutting-edge dating techniques. This should help lead to a much more refined idea of the nature of Blue Creek's abandonment. There are undoubtedly risks we face coming out here. In seems venomous creatures of every kind found on land lurk out here in addition to the snakes - scorpions, centipedes, army ants, and killer bees (really). First morning before working on ruins here, I saw a tarantula the size of my hand. Even the plants are no joke - one tree has a sticky black sap that can raise terrible boils on the skin. These risks pretty much confirm what everyone's always suspected about archaeology. We all have to be like Mandito. We all have to be a bit badass.